Making a gift doesn't always have to take a lot of time and/or talent. Here's something adorable you can make in minutes. The only skills needed are shopping skills. I saw this in a store in the mall (so I can't take credit for the idea), and thought this would make a cute gift. 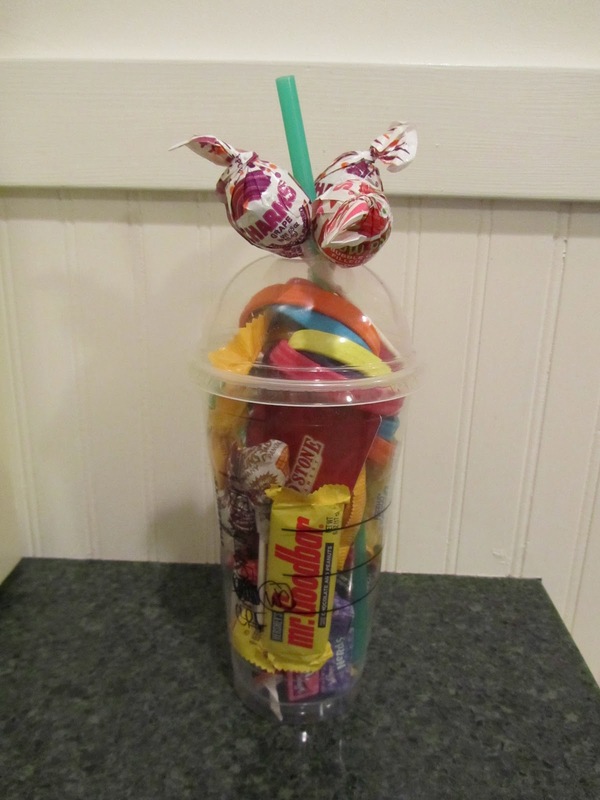 It was a clear plastic drink cup, topped with one of those domed lids, and filled with brightly-colored, wrapped candy. Here are a few ideas to improve upon it, as well as make it useful as a gift for adults. You'll need the domed, clear plastic drink cup. Starbucks uses them for frappuccinos, McDonalds has just recently begun using them for shakes, and Baskin-Robbins has a clear plastic cup, but I'm not sure if they have the domed lid. Anyways, start with the cup. How to get one -- You could just walk in and ask for one. You could buy a drink in one, then wash out. If you're truly frugal, you could ask a spendthrift co-worker if you could have their drink cup when they finish their frappuccino. Or, you could buy a small denomination gift card from one of these places, then ask for a cup to put it in as part of a gift. My guess is they'd give you one in this last case, and maybe even in the first case. So, you have the cup, now to fill it. 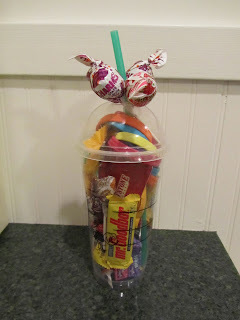 For a child or tween, fill a McD's or B & R's cup with wrapped candy, the gift card, with or without shreds of brightly-colored curly ribbon, and tiny trinkets (the kind you buy for 25 - 50 cents from a vending machine at the store -- if you have kids they'll know where to find these vending machines), or dollar store hair accessories (like colorful scrunchies and elastic headbands). Instead of a straw poking out of the hole in the lid, how about tucking in a pixie stix candy. This is the sort of gift that I could've sent my own child to a birthday party with. It would also be a great gift for an aunt or uncle to give to a niece, or grandma to a granddaughter. In this photo, I've filled the cup with candy, a Coldstone Creamery giftcard, and topped all with rolled up colorful elastic headbands. 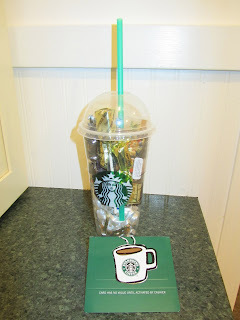 For an adult, use a Starbucks cup, fill with candy, individually-wrapped cookies or snacks (something more to an adult's liking), shreds of curly ribbon as filler, plus the Starbucks giftcard. Here, I've "nested" candy in a bed of white and gold curly ribbon. The candy chosen is wrapped in gold, silver and black, and I've tucked a Starbucks giftcard in the midst of it all -- a nice office or friend gift, for under $10. 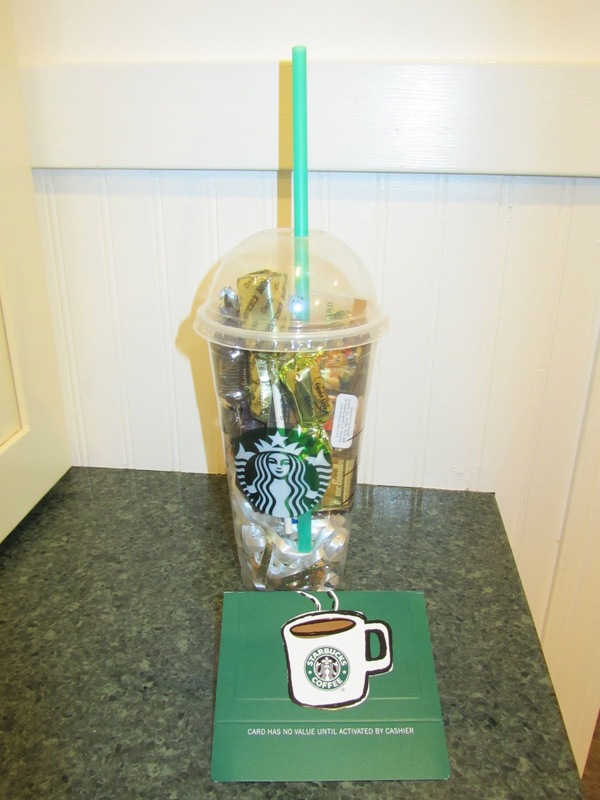 These filled cups are a fun and imaginative way to dress up a gift card. A lot more festive than just the card in its little hangtag holder.